What Appetite Suppressant Really Works? There are many over the counter appetite suppressants on sale. Some of them work well but others do not. How do you learn which suppressants really work? Going through amazon reviews may provide you some basic clues, unfortunately, it can be futile simply because everyone's body is different and an appetite suppressant that really works for someone else may not work for you at all. It's probably the most ideal to try a few hunger suppressant supplements and see which will really work for you the best. Make sure that when you're buying an appetite suppressant, it comes with 30-day open bottle money back policy. Read the fine print to make sure the seller will also refund shipping charge and there are no restocking fees. We offer no questions asked 60-day FULL money back policy on our Skinny Piggies appetite control diet supplement in order that you can try it and see if it really works for you. Which Appetite Suppressant is the Most Effective? How Effective Are Fiber Gummies? Which Fiber Supplement is Best for Lowering Cholesterol? Sick of bland meals and boring diet programs? Having no fun AT ALL? Let's be frank, lots of people don't enjoy diet programs. It's not fun giving up foods you love, not fun feeling hungry, and definitely not fun to exercise when you'd prefer to just collapse onto the armchair watching a new episode of Gilmore Girls. 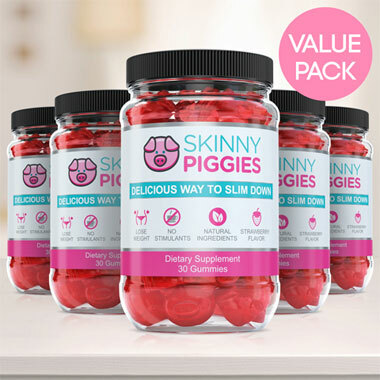 Thankfully, now you can support your diet with a unique, all-natural appetite suppressing supplement, Skinny Piggies! 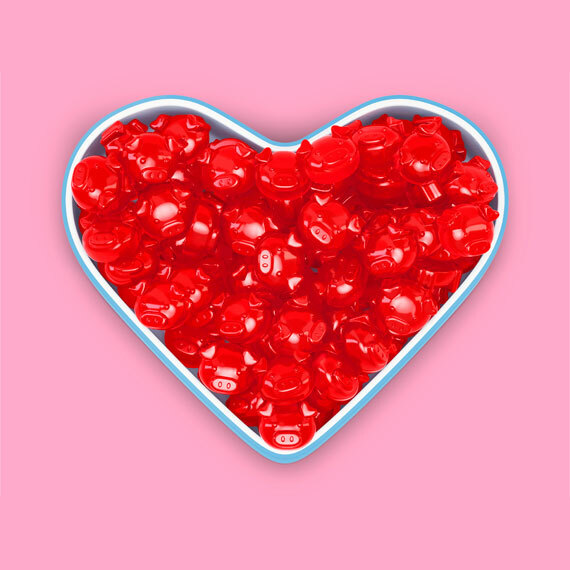 These are great-tasting strawberry flavored supplement gummies that help you avoid hunger and food cravings while enabling you to remain in fat-loss mode. Sounds too good to be true? Let's take a look at what's behind weight-loss. In order to burn off more calories than you take in, you either need to ramp up the exercise or reduce how much of food you eat. To get ideal results, you may really want to do both. Skinny Piggies help you eat a lot less and cut down your caloric intake and that makes achieving weight loss easier. Add in an extra daily physical exercise to help accelerate the fat loss process. Wait a second! This sounds good, but start cutting those calories and carbohydrate cravings will set in, as well as hunger that becomes very hard to control. And that's when Skinny Piggies diet gummies can help! Skinny Piggies are fun, delicious healthy snacks you won't have to feel guilty about! Enjoy the mouth-watering flavor of these appetite suppressant gummies and let them do their magic. Ok, what exactly are the gummy supplements doing for you? How Do Skinny Piggies Appetite Suppressant Gummies Work? Hunger is driven by: energy consumption and the feeling of food in the stomach. After you eat, your stomach gets full and your stomach stretches. That makes you feel full and satisfied and you stop eating. When you eat one Skinny Piggy just 30 mins preceding your lunch with a glass of water, it will expand to a soft gel, stimulating sensors in your stomach, letting the brain know you had a lot of food. When you eat later, you are partially full and eat less calories. That's how you can lessen desire to eat and food cravings, hunger, and keep your caloric intake down, all without being starving most of the time. The gel also enables your stomach to empty slowly and that will make you feel full for many hours. The longer you feel satisfied, the less likely you will continue eating that allows you to accomplish a lower calorie intake. The liquid gel slows down the digestive function of carbohydrates and flattens your blood sugar level. By reducing sudden changes in your blood glucose level you are preventing those strong sugar cravings too. Reducing blood glucose spikes by slowing down digestion of sugars, helps prevent your meals from being stored as unwanted fat. 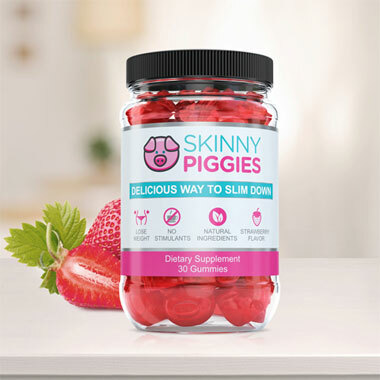 By putting your body in fat-burning mode, Skinny Piggies appetite suppressant gummies help your body lose weight. Yummy Flavor: Very few gummy products taste good, and none of them have the same delightful flavor of strawberry gummies, meaning that Skinny Piggies gummies are a pre-meal snack you'll look forward to. Genuine Ingredients: Unlike most weight loss supplements, it's possible to pronounce all active ingredients in Skinny Piggy supplements, ensuring that you're filling your body with only the best quality ingredients. No Chemicals or Stimulants: Taking a dietary product with no harsh caffeine and that's why there aren't restrictions on when you can use them. Nutrient rich Nutrients: In addition to helping you suppress your appetite, they will also help the growth of healthy hair and keep your skin looking younger. Losing weight is difficult, but yummy Skinny Piggies are here to help you make your efforts more easy on you. You will like the fruit taste of our appetite suppressant gummies, so forgetting to take them won't be an issue. 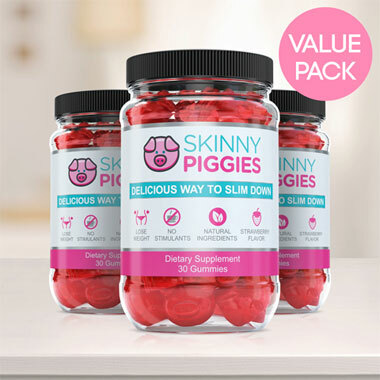 Easy to take and fulfilling, Skinny Piggies are weight loss gummies that is fun to take.